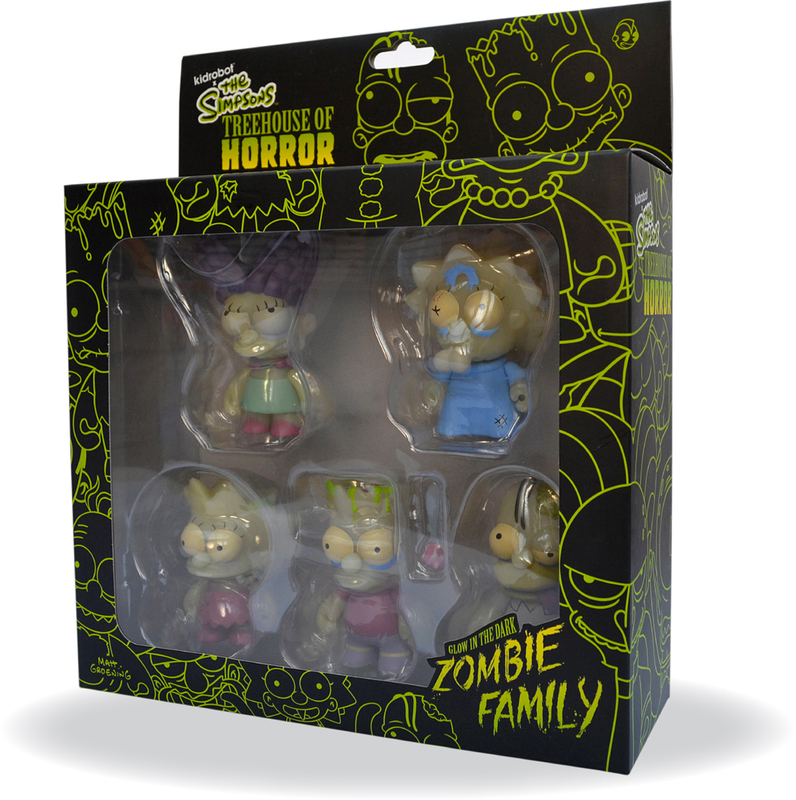 Kidrobot’s The Simpsons Zombie Family | 'TAIN'T THE MEAT… IT'S THE HUMANITY! 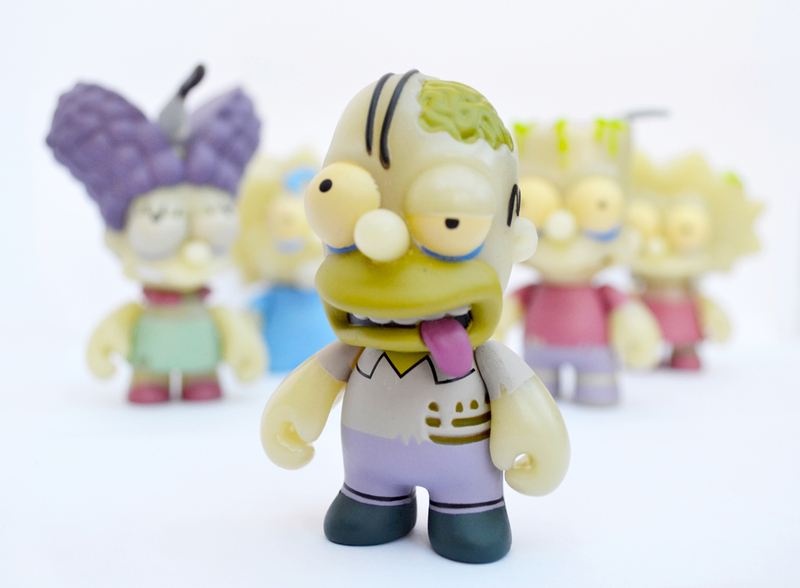 The Simpsons Zombie Family designer toys were originally included in Kidrobot‘s second collection of Simpson’s figures in 2010. Originally released in blind-boxes all five characters – Homer, Marge, Bart, Lisa and Maggie – have now been collected together in one box set. 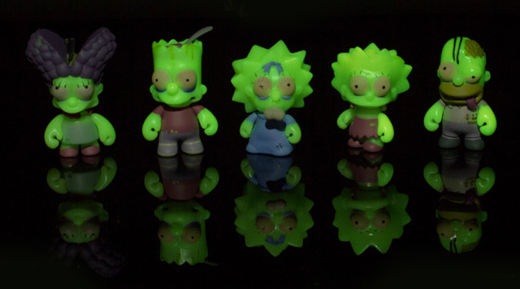 Inspired by the long-running Treehouse of Horror specials, all five toys are around three inches tall and are identical to the 2010 originals with one important difference: the new toys now glow in the dark. All five Simpson toys feature articulation to the head and arms, are made to Kidrobot’s usual high standard and have a pleasing chunky feel to them. Marge is my favourite of the bunch (love that axe to the head) with Bart and his spooned brains coming in a close second. 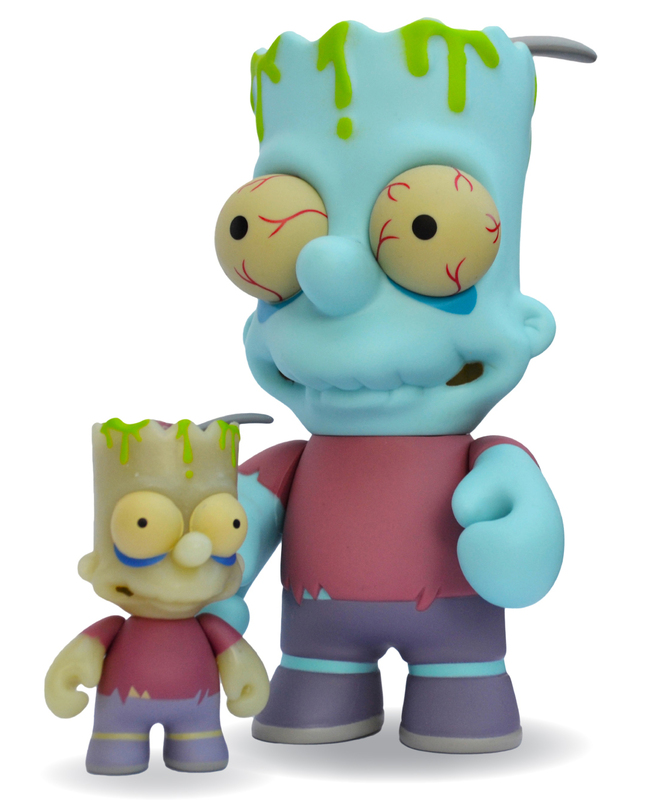 And speaking of Zombie Bart, Kidrobot have also released a limited edition six-inch version of this toy. Sadly his larger version doesn’t glow in the dark but the increased amount of detail is welcome, especially his bloodshot eyes. This larger version was released earlier this year and is currently selling for around £40. Overall, I’m very pleased with these glow in the dark designer toys and they look great on the shelf next to the Series One and Two figures in my collection. Although I can see the appeal of releasing these figures in blind-boxes, I suspect most casual collectors simply wait for opened versions to appear on ebay before buying them (I know I do), so it’s nice to have the opportunity to purchase the whole set without having to buy them individually. Granted, this set may not prove as valuable to hard-core collectors as those original blind-box versions, but for around £40 for all five figures I’m more than happy with this set. I’ve illustrated this post with photos I’ve taken of the set so you can get a better look at the Zombie Simpson’s in all their gruesome detail. Previous PostKidrobot’s Bumblebee ManNext Post‘Tain’t The Meat… It’s The Humanity!